We’ll start with a single graph. This shows the number of new CSS repositories created on GitHub every month this year. 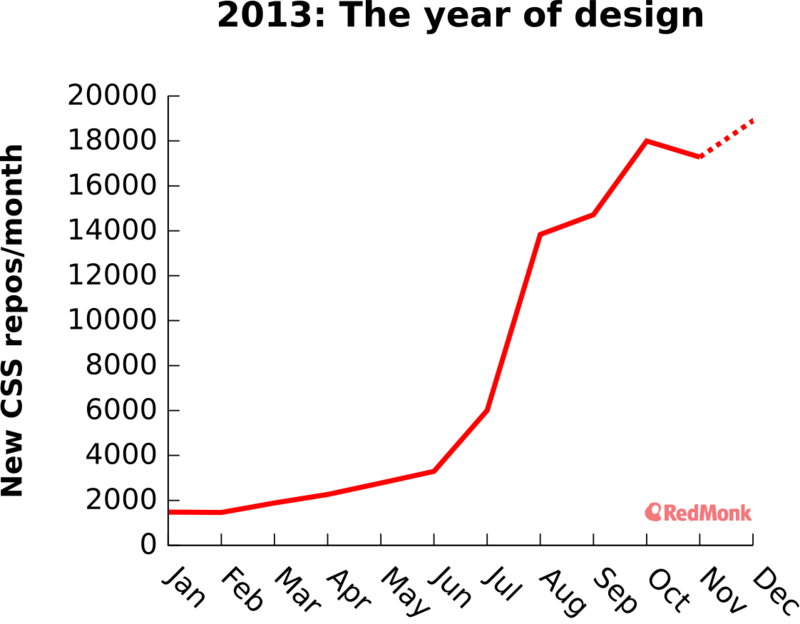 Data from the GitHub search API; projected through the end of December as of Dec. 13. Forks were excluded from this search. Classification based on the language in a repository with the most lines of code. If you’re not blown away, look again. 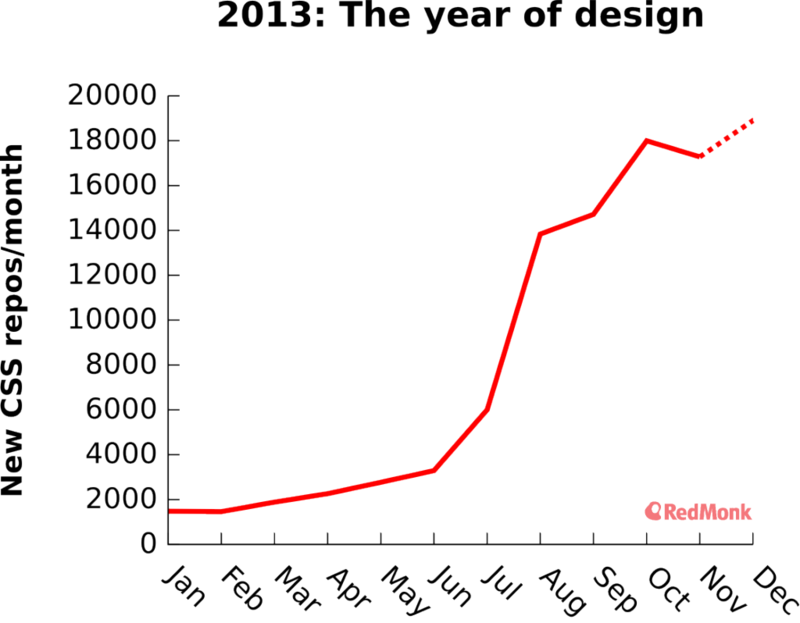 Growth of CSS, the language of web design, has gone completely insane on GitHub over the past year. This does not include forks. This is newly created repositories. Prior to 2013, it hovered near 0% of total repositories created since GitHub’s launch and then suddenly shot up this year. This corresponds to a jump from ~7,500 repos created last year to ~102,000 this year, a 13.6x increase. Design is now happening more and more in the form of code. It’s less and less about people who boot up Photoshop (and I use that term purposefully, because it takes that long to start up), work exclusively in there, and hand off a PSD to the development team. It’s about designers who understand the language of code, and coders who understand the visuals of design. If you’ve heard of DevOps [writeup], you’ll notice a lot of similarities. While it’s not about mythical unicorns who are full-stack developers and top-notch designers too, it is a much deeper integration and cooperation that it has been in the past. What’s actually happening here is the advent of the technical designer and the creative coder. At Eyeo this summer, a conference exclusively about data visualization, I had a rare opportunity to meet the other side of this spectrum (as someone who spends most of his time around developers). It was very much an artist-centric show — and yet the vast majority of talks used things straight out of the coder’s toolbox rather than manual work in Illustrator, Inkscape, or a GUI data-viz tool like Tableau. While not the only example, Adobe is an obvious one of a company with existing and potential customers that exemplify the kind of people I’m talking about. The company as a whole has recently seemed rather unsure about whether it still cares about developers. Back in the Flex and ColdFusion days it clearly used to, and the vast majority of its Max conference attendees used to be devs. But no more — at this year’s Max, developers were distinctly in the minority, often overlooked in the mix. Most of its products no longer cater to developers, and it hasn’t been clear whether Adobe knows why or how much it should care about them in a world of Photoshop and Omniture. The Nitobi acquisition, which brought PhoneGap into Adobe in late 2011, seemed rather out of place in the modern Adobe. Although PhoneGap seemed out of place at the time, how could it help Adobe fit into the broader world of software, which has changed a lot in the days since Dreamweaver was in its prime? And what changing trends among how software gets designed and developed might affect the broader vision of what companies like Adobe should stand for? Interestingly, Adobe’s begun reaching toward the far end of the design workflow with its recent announcement of Generator for Photoshop. In short, you can take a design in Photoshop and send it directly to Reflow where it’s ready to be transformed into a responsive website. VentureBeat’s Jolie O’Dell was the only journalist to nail the core point in her writeup at the time, getting the broader context of a growing Adobe linkage between designers and developers. However, the point I’m getting at is bigger than just a linkage. It’s not about a design team shipping things off to a developer team anymore. It’s becoming — and already is, in leading-edge companies — a much tighter integration that resembles the DevOps culture. It’s about developers who can do some design, and designers who can write some code. Maybe not enough to replace the other side, at least not yet and not with existing tools … but enough to have a strong understanding of how the other side lives, and what they care about, and how they work. What’s been missing is the equivalents of cloud and configuration management in the DevOps world, to provide those central stepping stones across the river between designers and developers. It would enable developers to better understand how to interact with Generator and what it’s capable of. Perhaps the best documentation is the source code itself. It sometimes seemed to me that Adobe hadn’t so much acquired Typekit as the reverse: that the people and thinking behind Typekit are now running Adobe (which is actually true), and that the mindset of some of the smartest consultants and designers in our industry is now driving a huge corporation. 3) PhoneGap and large portions of the Edge suite cater primarily to developers, but some of them, such as Reflow, do reach out to designers. However, they still stand out rather like a sore thumb in Adobe’s product lineup, because of the lack of integration and the lack of thinking about this as a spectrum. 4) Adobe’s experimented with open-sourcing some fonts, showing that the design side of the house is testing the waters of development. LWN wrote it up; consider it recommended reading on a group open-sourcing something for the first time. Adobe’s not alone in thinking about design. First SAP, and more recently IBM [writeup], have been pushing the idea of design thinking in software. What makes them interesting is that it’s software that has traditionally been an absolute nightmare to run, because those vendors had only cared about the buyers. Who gives a crap about the users? They don’t have budgets, they can’t make the call about what to buy. But times have changed, and now everyone, even the enterprise behemoths, needs to think about design. 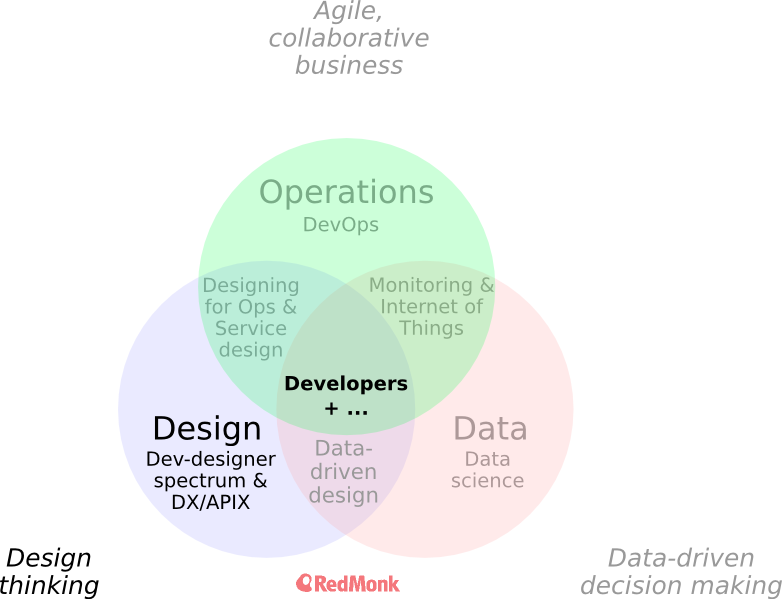 At RedMonk we’re focused primarily on helping companies create a great developer experience, which surprisingly focuses on a lot of things that coders consider peripheral, such as packaging, barriers to entry, and convenience. My colleague James describes it briefly in this off-the-cuff video from the streets of London. The extension of developer experience is design thinking throughout the company, including its products, portfolio, and even the experience for its own employees. I’m not going to talk about service design in this post to keep it from turning into a book, but that would be a natural consideration if you mix devs, designers, and ops. As I wrote last month, DevOps needs to pervade back into the whole company to help it transition toward becoming an agile, collaborative business. In this context, however, we should think about extending DevOps to include design — call it DesDevOps if you like (I don’t particularly care about semantics). Why is it solely an interaction starting with the development team and going through to production? Why shouldn’t it go back to designers too? In the same way that DevOps enabled companies to deploy software 100 times a day, there’s no reason, besides broken workflows and processes, that we can’t dramatically accelerate how we bring designed software to users to iteratively improve their UX. Update: Dion Almaer pointed out that what a “CSS repo” is lacked clarity. Caption in the first graph updated to clarify this. Disclosure: Adobe, IBM, and SAP are clients and covered substantial portions of travel expenses to their events. GitHub has been a client. Tableau is not a client. I randomly won a pass to Eyeo in a drawing after not getting one of the few media passes. Categories: adobe, creatives, design, devops, ibm, mobile, packaging, sap.